Prepare to be frightened, in a good way, by all the underclothed bodies, the sweating, and lights strobed out by some high tech equipment. Prepare to be swallowed in a sound driven body wave of swaying bass bums and kandi kids. 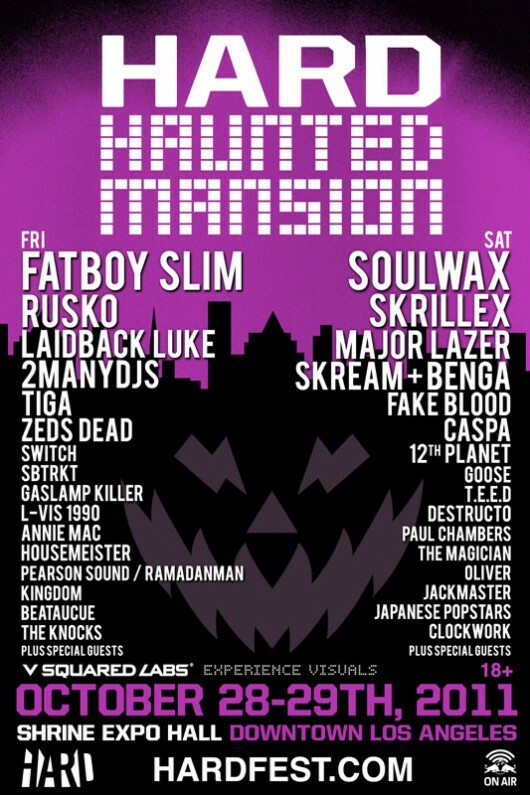 Folks, this is 8 hours of pure, visceral, blissful electronica noise, at HARD Haunted Mansion on 2 consecutive nights. Choose your night based on the lineup – Soulwax, Sbtrkt, Fatboy Slim, Skrillex and more. Dress appropriately – aka stay sway from too much fabric or wear a glow in the dark costume and give your friends light shows. Yes, you will wait in a long line at the entrance, no question. But our guess is that you’ll be surrounded by entertainment from beginning to end. Single day tickets for Friday or Saturday are still available at $75, and VIP passes are $125.